Three arenas known for their fantastic atmosphere’s will play host to Match of the Week in the first three rounds of the VELUX EHF Champions League. Tom O’Brannagain and Chris O’Reilly will be back to guide you through the highlight matches on ehfTV.com with English language commentary and here are September’s three destinations. It is impossible to look beyond this clash on the opening weekend, a clash of two heavyweights in a period of transition and hoping to go one better than their quarter-final exits last season. 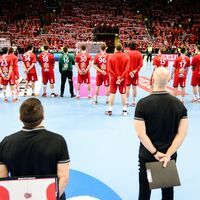 Two of this summer’s biggest transfer coups will be on show (Arpad Sterbik for Veszprém and Luca Cindric for Kielce) and Veszprém Arena is certain to be bouncing as both of these sides look to make a bright start to a new campaign. Belarus welcomes the defending champions in Round 2. After progressing from Groups C/D all the way to gold last season, Montpellier are certain to be Match of the Week regulars this season and their first appearance is a very tricky trip to Meshkov Brest. Brest has proven to be a stumbling block for many big sides over the years and the home side has lofty ambitions of their own this season after solidifying their status as a top flight club. The sea of orange in Kristianstad is always a welcome sight at Match of the Week and the visit of Barça Lassa in Round 3 is the perfect opportunity to see what the Swedish champions are made of this season. Two sides with attractive styles of handball will provide us with 60 minutes of entertainment, during which we will see how Barcelona’s newcomers have settled in and which young Kristianstad players will make a name for themselves with the handball world’s eyes watching.